KK music lovers are in for a treat. For one night only, American trumpeter Jacob Dalager will be blowing his own horn so to speak, here in Kota Kinabalu, performing a solo recital on June 26th, at Teater Tun Hamdan, Yayasan Sabah, Likas. Dalager holds a personal attachment to Sabah, residing here in 2009 for a year as a volunteer teacher at the Jireh Home, Tuaran. Upon returning to his homeland, Dalager graduated with a Masters of music from the prestigious Eastman School of Music, New York, but currently resides in Singapore as a much sought after freelance musician. He is as comfortable playing classical trumpet with the likes of the Singapore Symphony Orchestra, National Taiwan Orchestra and even our own Malaysian Philharmonic Orchestra as he is soloing in some of Singapore’s hottest jazz clubs playing with groups that cover everything from Gospel, Latin to Contemporary jazz. The programme for Dalagers recital here in K.K.is quite varied with pieces by Haydn, Bernstein and Radiohead sure to please everyone from the most avid music connoisseur to those looking for an entertaining night out in KK. The accompanist for the recital will be the renown Malaysia pianist, Grace Lee Sui Lin. For tickets or more information please call 016 8333 034. 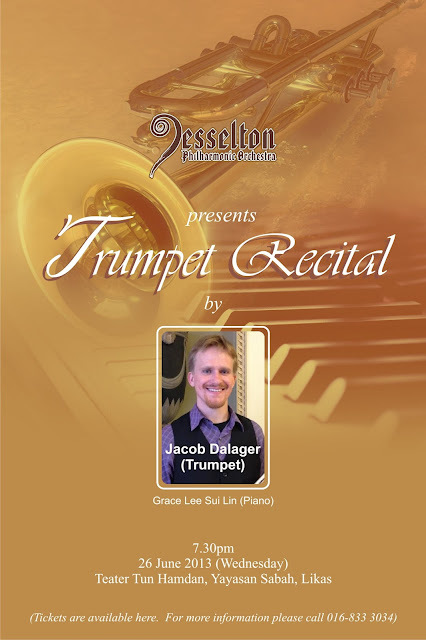 Jacob Dalager is a Singapore-based trumpet player, composer, composer, arranger, and educator originally from Minnesota, USA. He is Singapore's hardest working freelance musician and a rising trumpet star in Southeast Asia. He is a regular freelance trumpet player with the Singapore Symphony Orchestra, National Taiwan Symphony Orchestra, as well as the Malaysia Philharmonic Orchestra. Dalager is a frequent soloist in Singapore's hottest jazz clubs, playing in groups covering everything from Gospel, Latin, to Contemporary Jazz. He is also is a first call musician for arrangements, compositions, recording sessions, musicals, music festivals, choirs, and brass quintets. Dalager is a 2012 Master's of Music graduate from the Eastman School of Music in Rochester, New York, ranked the No. 1 music conservatory in the United States. While there, Dalager studied classical trumpet with James Thompson and played in the world-renowned Eastman Wind Ensemble, Philharmonia, Opera, and Brass Guild. In addition, he kept up jazz chops by playing lead trumpet in the Eastman Jazz Lab Band for two years. And he studied composition and taught two different courses in Aural Skills. In 2012, he was a semi-finalist in the National Trumpet Competition, performing Anthony Plog's Concerto No. 2 for Trumpet and Orchestra. Jacob's has undergraduate degrees in both Trumpet Performance and Music Theory/Composition from St. Olaf College in Northfield, Minnesota. There, he studied with trumpet Dr. Martin Hodel and Charles Lazarus, and composition with Dr. Timothy Mahr and Dr. Justin Merritt. He was a co-soloist with the St. Olaf Band, performing the Vivaldi Concerto for Two Trumpets and Orchestra, and soloist with the St. Olaf Orchestra, performing the John Williams Trumpet Concerto. In 2009, he won both the MTNA State music competition in the brass division, and the Schubert Club Competition Second Prize for the College and Graduate Level Winds and Brass division. His compositions have been commissioned by the Ancia Saxophone Quartet, Lirica Chamber Orchestra, International Community School, and St. Olaf Theatre Department. Dalager's works have also been performed by the St. Olaf Band, the Shamen, and the Eastman Brass. His band piece, Goin' Up the Line, was a finalist for the 2011 Morton Gould Young Composer Award. His works are often politically and historically inspired. He uses music as a medium not only to reflect on but to change the world. The topics of Dalager's compositions are both philosophically and sonically thought-provoking and engaging. Jacob Dalager is prized for his exciting, consistent, and versatile trumpet playing. His performances push the envelope of creativity and display world-class musicality, captivating audiences everywhere he plays. His versatility guarantees that there will be something for everyone to enjoy in his concerts, whether they prefer popular music, jazz, world music, lyrical songs, or virtuoso show stoppers. Jacob is excited to perform his first solo recital in Sabah and a concerto with the Jesselton Philharmonic Orchestra. He has a personal attachment to Sabah because he lived and worked as volunteer teaching English and music at Jireh Home in Tuaran, Sabah from 2009-2010. Sabah will always have a special place in his heart!